We packed our trailer and headed out from Bend, OR in mid-September with iflatables for cruising adventures and a couple of boards for SUP surf. 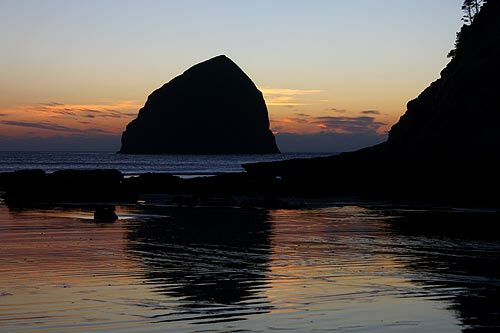 Pacific City – here we come. The weekend kicked off with the annual Longboard competition. 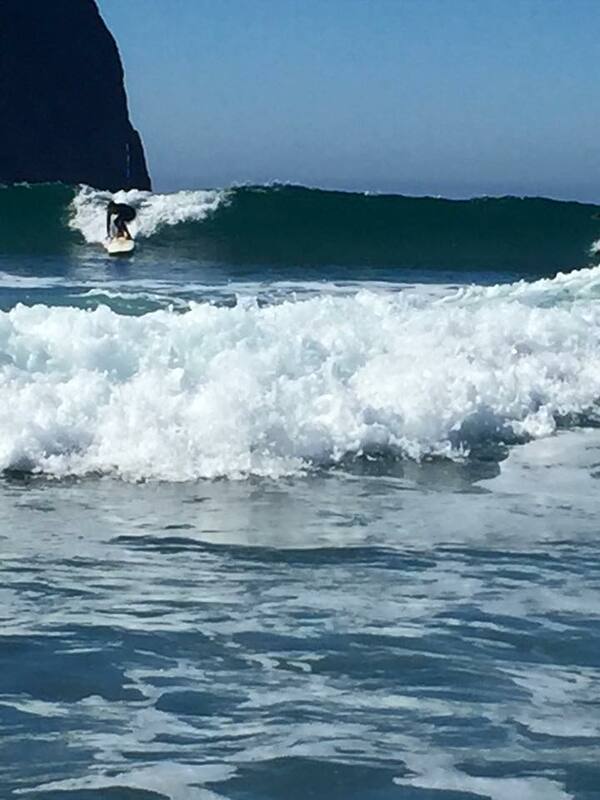 Saturday offered up some sweet waves, glassy and chest to head high. 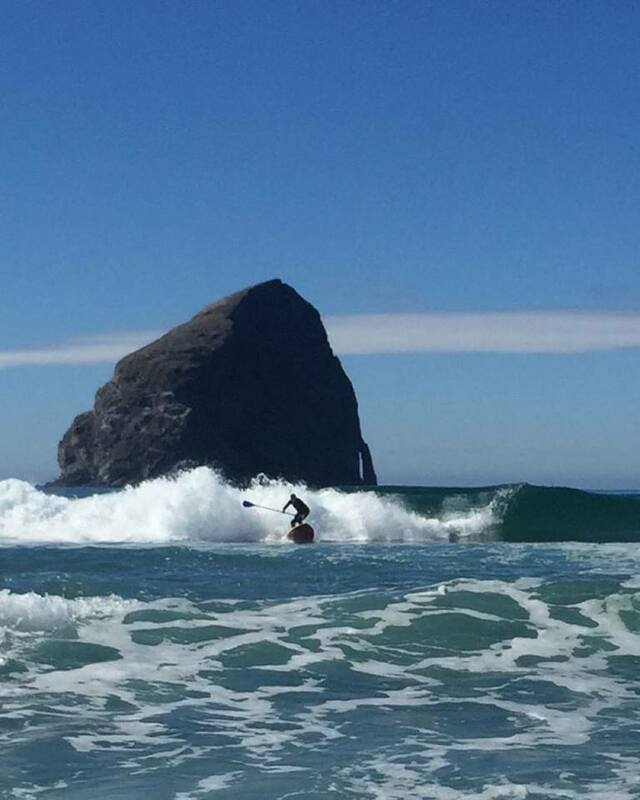 Riding a swell all the way to shore in the shadow of beautiful Cape Kiwanda on a warm sunny day is just about paradise. 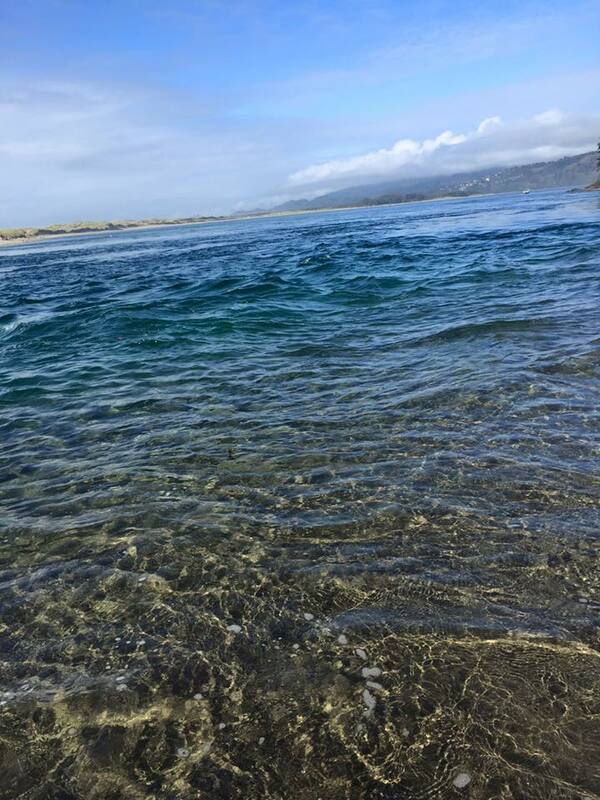 In spite of dozens of trips to Pacific City and a few days catching salmon in both the spring and fall runs, we had never paddled the branch of the Nestucca River that flows east from town all the way to the inlet where the Pacific comes roaring in. 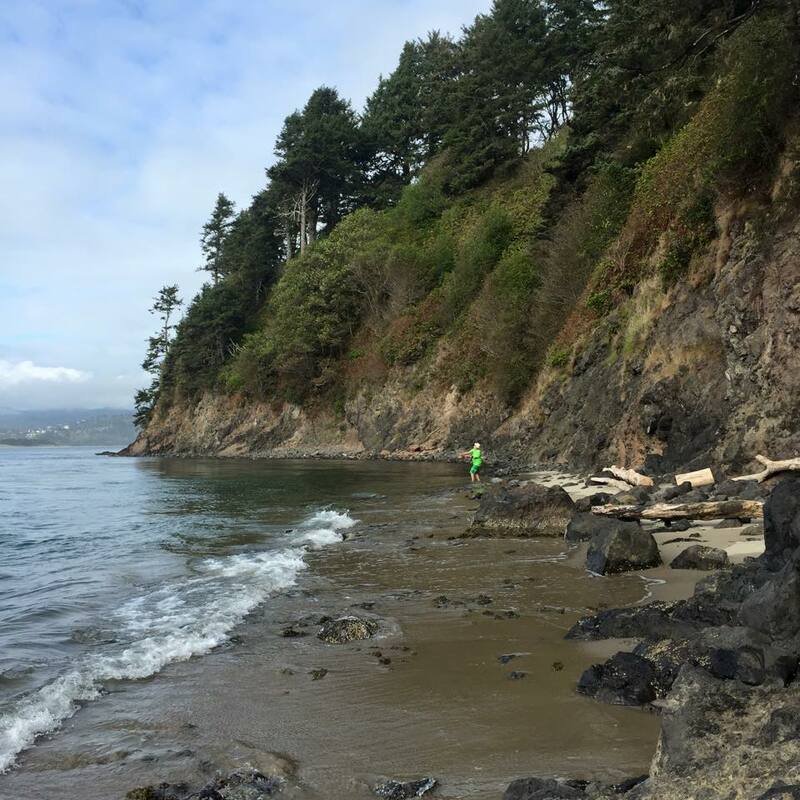 On our first trip we knew we were paddling out on an out-going tide. 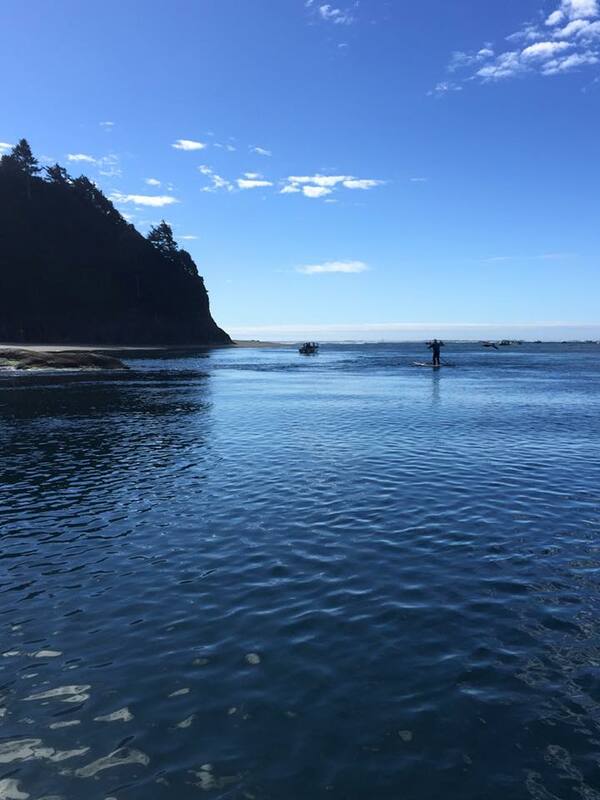 With a spinning rod on Ed’s board and my net strapped to my board we planned to fish at the inlet where all the boats seemed to have the most luck. 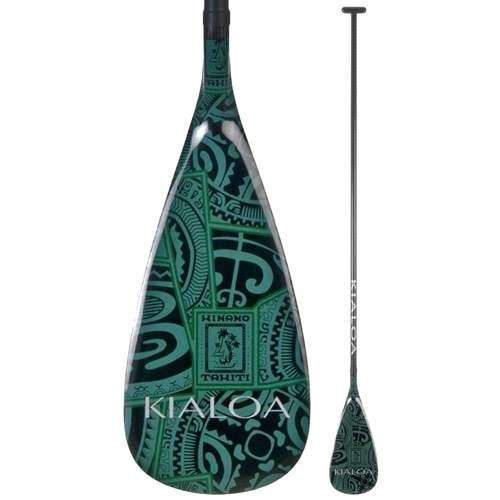 After a few hours of fishing, the tide would be incoming, making the paddle back a breeze. We put in at “Guardrails,” just across from Bob Straub State Park. The trip was idyllic – seals sunbathed by the dozens on untracked sandy beaches, forested cliffs reached high to the south and the closer we got to the inlet the more clear and marine blue it became. Currents swirled with plenty of energy as we approached the south side of the inlet. 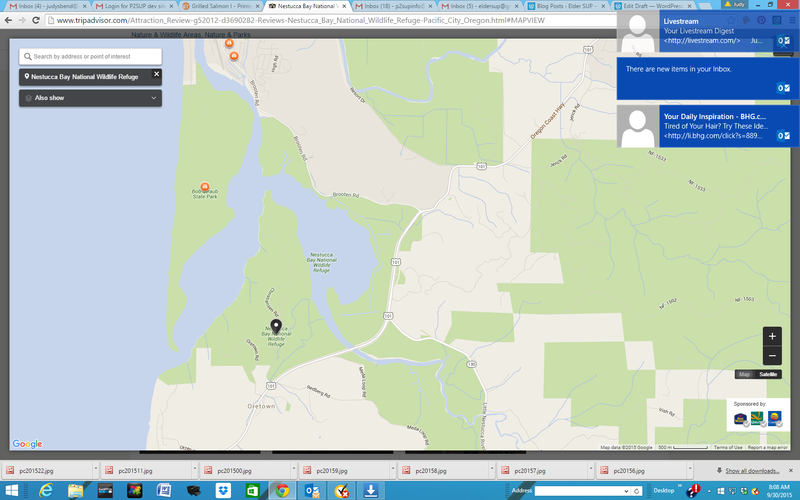 Absolutely wear your PFD and use a leash. There were so many combinations of eddies, waves and powerful current that it took concentration to get from the inlet area to the pocket beach we founf on shore – but was it ever WORTH IT! After about an hour of casting, Ed hooked in to a HUGE salmon. As it leaped, guys in the 16 boats fishing the inlet gave a thumbs up and the fight was on. Just as Ed was about to get spooled, the fish began to turn. Then, unawares, a boat cruised across the inlet and cut the line. We lost the fish but gained some friends among the fishermen. A few days later we were back for the third time and one of the guys from the first day – the BIG fish day – offered to put Ed in his boat and take him out for a salmon. They had caught their limit and had to admire Ed’s presistance. I also think they admired our trips up and down the river stretch paddling our SUPs in all kinds of conditions over the week. The one day that an incoming tide couldn’t match the 20-25 mph headwind on our return home was something we would not like to repeat. Even the best laid plans come up against good old Mother Nature. 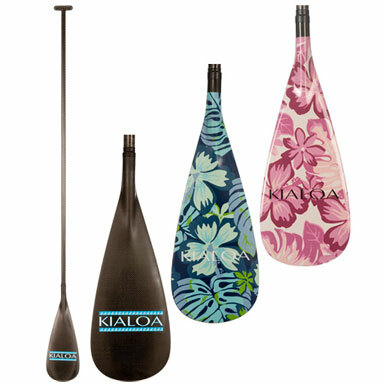 Be prepared, know your waters, tides, winds and currents and stya with your paddle buddy. Our last night in Pacific City with fresh grilled salmon, a beach walk at sunset and a local brew could not have been better. Wanna Be Like Candice Appleby? 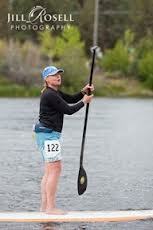 For many standup paddlers events and races drive our focus. It’s only natural to look at the podium after events and observe the sport’s leaders we admire. As the top ocean athletes pose for that podium shot do you ever think, “I wanna be like that.” At the August 2012 Columbia Gorge Paddle Challenge I gained more awareness of what “like that” meant for many of the watermen and women. Wanna be like Candice Appleby? Looks like a great position to be in at the first place spot on the podium. Flanked on both sides by six other leaders, Candice graciously accepted the check and trophy while acknowledging what a close, exciting race it had been all the way to the end. Are you shaking your head, “Yes, if I won races I’d be like that too.” Especially if, when you were 12, your parents moved to one of the best surf towns in the country. It’s easy to think that’s what formed Candice into the champion she is – but fortunately there is much more to her. In those aspects of her life, guess what? We can be like Candice Appleby. Discipline, focus, perseverance and “fun at work” are all key to what makes a champion. No one is born fit and ready to be at the top of their sport and at the peak of their game. Training happens daily and consistently. Wanna be like Candice? Be your best condition, your best technique and your best focus. Candice launched an Anti-Bullying campaign called “Stand Up for the Children.” Wanna be like Candice? Is there an issue or challenge of importance to you in your local community? Step up and participate or lead for change. The busiest among us seem to be the ones who take the time to make a difference. In her free free time Candice volunteers with the Jimmy Miller Memorial Foundation, taking Marines from the Wounded Warriors Battalion surfing as part of their Ocean Therapy. What expertise can you share in order to enhance the lives of others? One last aspect of our SUP sport is the incredible opportunity we have to mingle among the top athletes, paddling in the same conditions and running through the same finish chute. We also might share some similar pre-event butterflies. I had never paddled the Columbia River with its howling winds, big swells and big barges (that’s another story altogether!). 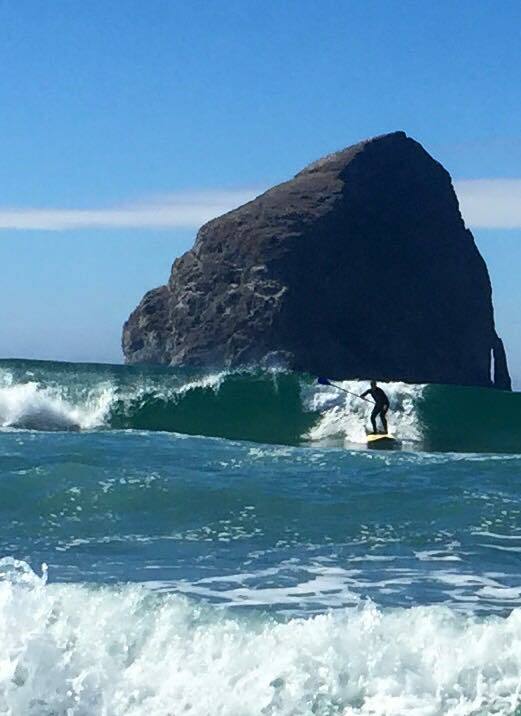 Surfing on the Oregon coast had been good preparation, but at the beginning of the race I wasn’t too sure. Good friend, Brit Oliphant had started her confidence building for me the week before – and that was why I was there ready to participate. The last minute help I got from Candice was much appreciated as well. Candice was sitting at a shaded picnic table a few minutes before the start of the downwind course, adjusting her earphones and selecting her music. I sat down next to her, probably looking pretty darn serious when she casually started up conversation. It didn’t take her long to share a few pointers and instill that last dose of confidence I needed before launching into the 25-40 mph gusty winds. That gesture of sharing resonated well with me. I tend to “go inside” when nervous but Candice demonstrated a better strategy. By taking the time to be aware of others who may need just a bit of encouragement I might have the opportunity to quell their butterflies – and mine. Pick your own way and your own path (paddle) to enjoy our sport the way Candice does. Look around – our top athletes have done just that. What a cool community within our sport we can be part of.